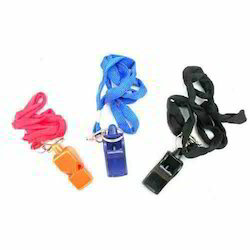 Being the well-distinguished companies in the market, we are into offering Sports Whistle. 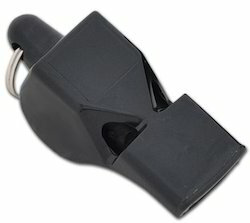 These whistles are ideal for refrees, crowd control and traffic management. They come in a pack of 12 pieces. Each pack contains 2 to 3 different colours. These whistles are also available only in black. The whistles shown in the image are made up of plastic. Metal body whistles are also available. - Wonder Plastic Whistle is more bigger in size having cork pea inside. - Provide high pitch sound. We are offering Whistle And Lanyard to our clients. In order to keep pace with never ending demands of the customers, our company is instrumental in offering Plastic Whistle. Brass captains whistle keychain makes a great gift for a maritime enthusiast, navigators or sports trainers or football coaches. The keychain rings with a shrill undulating whistle. The whistle may be taken out of the keyring and worn around the neck.